I know it comes as no surprise that Mom is nowhere to be found and there hasn't been any typing here at The Sour Dough since the end of last month. Further, I know it won't surprise you at all when I tell you that since Mom last visited these dusty and musty webpages, that she has been home for less than three days. It seems that Mom is on her end of the year world wide tour of projects and conferences. I'm calling it Red-Eyeapollza in honor of her bloodshot eyes from all those late night flights. When Mom does come home, she barely has time to restock the cat food and do her laundry let alone cook or bake anything. She is even scraping the bottom of the normally well stocked pantry when she does make an appearance. For example, on Wednesday night this week, she showed up on the doorstep at 11:30pm after a flight back from LA starving. After dumping her luggage, starting a load of laundry, and feeding me a bonus can of cat food she scrounged around the pantry and came up with a bag of instant brown rice, a can of Rotel tomatoes, and a travel container of tuna fish for a late night dinner. The best part of that impromptu meal? We're hosting Weekend Cat Blogging here at the Sour Dough this weekend. 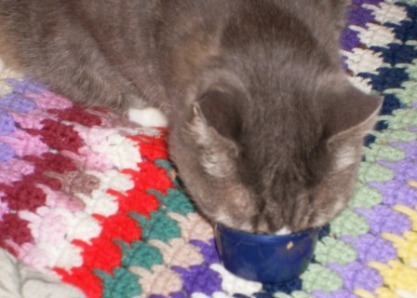 We're hoping all the other kitties in the blogosphere get as nice a treat as I had. So, stop by, leave a comment and let us know what you are up to!